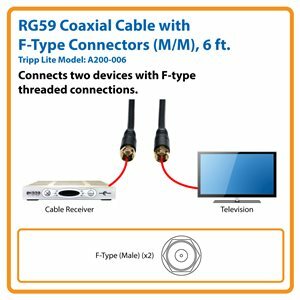 Tripp Lite's RG59 Coax F-Type cables are constructed of double-shielded, 23 gauge, 75ohm Coax cable, and are used in video applications such as Cable, Satellite, and any peripherals with Coax F type threaded connections. 24K Gold plated connectors and fully molded ends ensure long life reliability and crystal clear video. RG59 Coaxial Cable with F-Type Connectors (M/M), 6 ft.
Tripp Lite’s A200-006 23-gauge 75-ohm coaxial cable is ideal for video applications with F-type threaded connections, including cable and satellite receivers, VHS and DVD players, and coaxial-enabled televisions. First-class foil and braid shielding delivers reliable, error-free signal quality and protection from EMI/RFI interference. Fully molded F-type connectors feature corrosion-resistant 24-carat gold plating for excellent conductivity and screw tightly to ensure crystal-clear video. An abrasion-resistant, flexible PVC jacket makes installation a breeze. The A200-006 comes with a lifetime warranty. It’s manufactured in compliance with strict RoHS specifications, reflecting Tripp Lite’s commitment to environmental responsibility. A200-006 RG59 Coaxial Cable with F-Type Connectors (M/M), 6 ft.